Hawaii and Omuta in Fukuoka has had a goodwill relationship for many years. 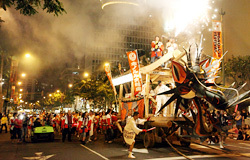 Thus, Omuta’s famous summer matsuri “Omuta Daijayama” that has been featured in past parades of the Honolulu Festival was changed to “Honolulu Daijayama” in 2008. 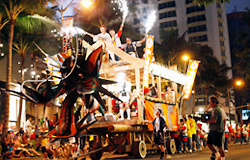 Honolulu Daijayama will once again participate in the Honolulu Festival’s parade down Kalakaua Avenue this year. The intensity of their performance, the bells ringing loudly, the fire gushing out, smoke spreading throughout the parade route, is an unforgettable sight for spectators seeing the Daijayama for the very first time. The Honolulu Festival has inherited the mikoshi that is used for Honolulu Daijayama from the city of Omuta. It was the Omuta people’s strong desire that the people of Hawaii be able to experience the authenticity of their mikoshi and enjoy the traditions that go along with the festivities. And furthermore, so that the children of Hawaii can experience these same emotions, Chibikko Daijayama was given to the Honolulu Festival in 2009. The number of local volunteers has grown each year. It is a wonderful sight to see the people of Hawaii support the Honolulu Daijayama!